Laguna Hills-based Olympica Gymnastics sent their top qualifiers to Reno, Nevada April 13-15 to compete against the top gymnasts from California, Nevada, Utah and Arizona. Dana Point’s Natalie Bray won a coveted spot on the Southern California combined Level 8 team thanks to her previous state championship wins on floor and the all-around. The top 12 gymnasts in the state competed together, and Bray contributed to the team’s gold medal win. San Clemente Level 8 gymnast Abby Howard won bronze on vault with a score of 9.475. 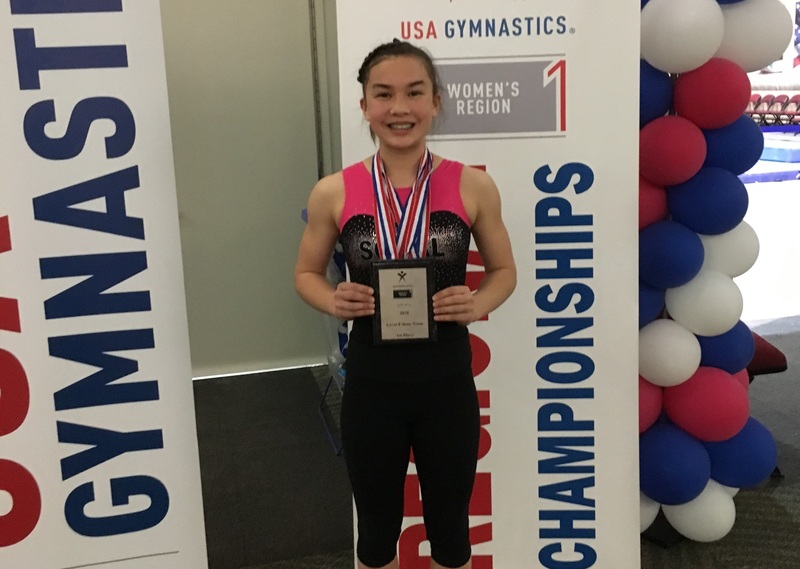 Sarah Quan of Ladera Ranch became the Region 1 Champion on bars with a score of 9.700, her sixth gold of the season on bars. She was also crowned the regional champion on beam with a gold medal score of 9.650. Quan took silver on floor (9.500) and finished second in the all-around competition with a 38.000. Teammate Allison Karner of Laguna Niguel won silver medals on vault (9.500) and the all-around (37.925) along with bronze on bars (9.600). Level 9 gymnast Anna Vultaggio of Coto de Caza scored 35.350, taking seventh place in the all-around to secure her spot at the upcoming Western National Championships in Salt Lake City, Utah where she will face off against the best gymnasts from 25 states. These wins add to Olympica’s Level 7-10 teams’ record breaking year of 30 bronze, 47 silver, and 40 gold medal wins in the seven-meet season. A team of golfers from Bella Collina San Clemente used their home-course advantage to hold off charges from the teams of San Juan Hills Golf Club, San Clemente Municpal Golf Course, and Shorecliffs Golf Course to take the title and trophy for this year’s South County Cup Golf Tournament on April 14 and 15 at Bella Collina San Clemente. Each club fielded a team of 16 players that competed in a two-day Ryder Cup match play format that saw team-partner play on Saturday in best-ball and alternate shot formats and individual match play on Sunday. Each match was worth one point for a win. Bella Collina team captains Tim Fyffe and Craig Hammer led their team to victory that saw an extremely tight battle for the second spot as well. With the final results tallied, Bella Collina posted the win with 20 points, and San Juan Hills and San Clemente Municipal tied for second at 15 points. Shorecliffs followed closely in third at 14 points. The fourth edition of this event, having now completed the rotation among all four of the area golf courses, will move back to Shorecliffs for next year’s competition.